We arrived in Abu Dhabi at 4.30am local time and made our way to the hotel. We moved our breakfast to this day so we could have three days of uninterrupted rest! The breakfast was amazing with cereal, fruits, fry ups, omelette, spring rolls, waffles, crepes, passionfruit competes and lots of tea and juice. Just what we needed after a long time of dodgy food! The hotel was just as beautiful as I hoped it would be with a private beach and a huge pool to sit around. 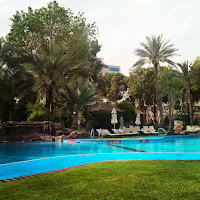 Most of our time here was spent around this pool, under an umbrella so we didn't get too burn under this hot sun. Usually over the hottest hours (1-3) we went inside to the spa where we could play in the Turkish baths (three pools of different temperatures - 33, 36, 38) and a steam room. There was also a hydrotherapy pool which gave amazing back massages. The sea was very salty and very blue - this made it very easy to float around. 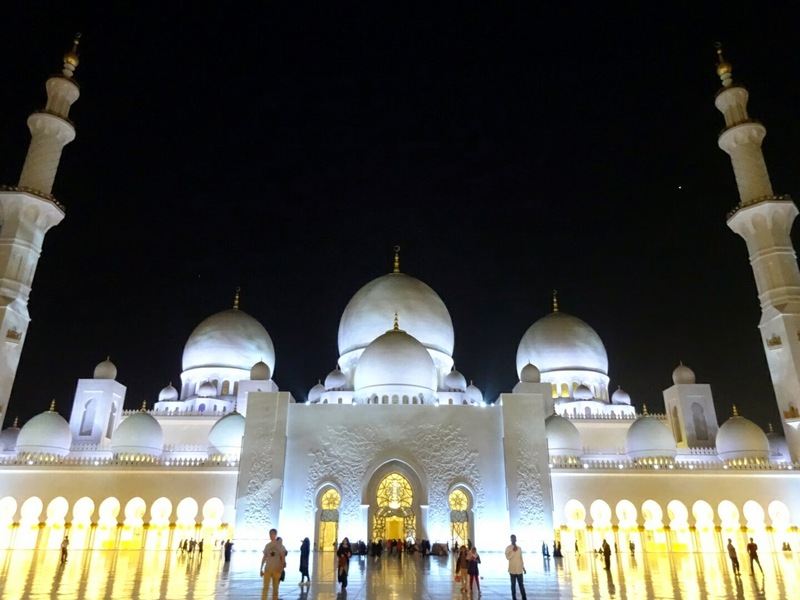 Our only venture outside of the hotel was to visit the Sheik Zayed Grand Mosque. We left the hotel at 5.20pm and didn't get to the Mosque (9 miles away) until 6.45pm. The streets in Abu Dhabi are mental. There are so many crossroads that you are constantly stopped by lights and the traffic is awful. Additionally, every road looks the same, it's as if the city was designed by a newbie on Sim City! 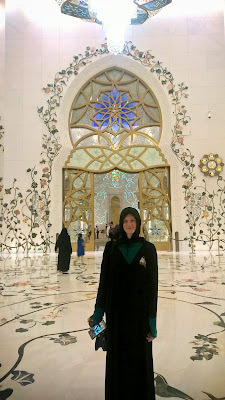 When we finally arrived at the Mosque we are pretty sure we went in the wrong exit as we couldn't find the robe rental (as I needed to cover my hair to enter). We got pretty close to the Mosque before I was stopped by security. They then preceeded to take me there. Finally robed up, we were able to look around the Mosque. The outside was spectacular (as Matt described it) but the inside was equally amazing with beautiful stained glass and the largest carpet in the world! We were unfortunately unable to explore all of it, perhaps due to the fact it was prayer time. We asked security hotel to get to the closest bus stop and the buggy once again drove us there. When we got on the bus it was almost empty, so we sat at the back. As more people got on the bus, it became evident that the bus was segregated - women at the front and men at the back! Men that had to sit opposite me looked awkward and some preferred to stand than have to sit there! The bus was an uncomfortable hour journey and we were both glad when we could finally get off! 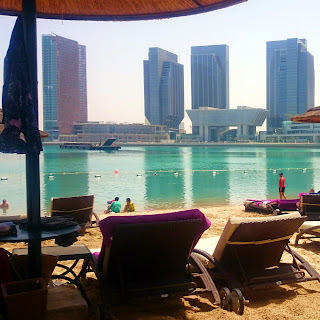 Abu Dhabi was the perfect end to one of the most amazing holidays I have ever been on!